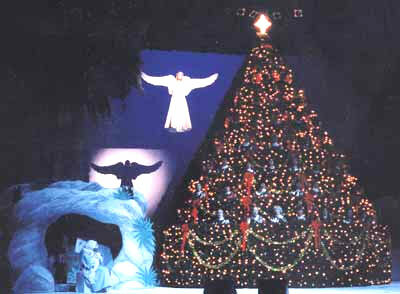 2002 was Lakeside's first year using the MidiLite system for their Living Christmas Tree! They are starting with a MR4 rack, with a 3x10x6 matrix but they are prewiring their tree for a 10x9x6 and usering threefers to combine blocks. This will allow for easy expansion into the full matrix at a later date by trading in the threefers and adding a MR6 rack. Visit their web site for more information about Lakeside Baptist.